Volume 1 (Intermediate) and Volume 2 (Advanced) are some of the world’s best combinations and turn patterns from one of the World’s Best Leads, Mr. Jose Luis Giuterrez. 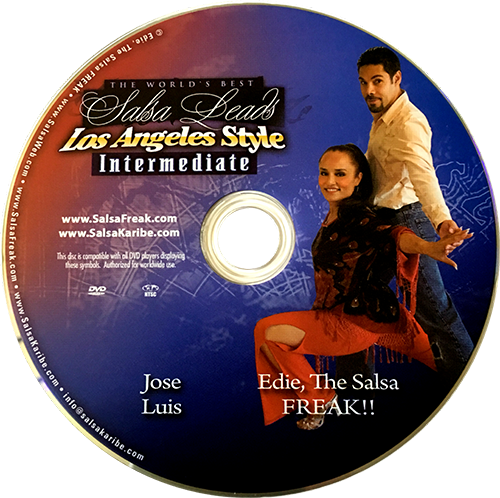 In both of these DVDs, Jose Luis and Edie, The Salsa FREAK!! take Salsa to the next level. In its purest sense, LA style is exhibited here with perfection, power and flair. Edie explains in explicit detail every aspect of Jose Luis’ impeccable leading techniques and secrets. His dance style and technique is second-to-none in the world of Salsa. EVERY beginner thru advanced dancer should study both of these DVDs like a hawk; memorizing every technique to its intricate detail. This DVD series is a MUST for the serious dancer wishing to perfect their lead.